Author(s): Baowang Lu, Katsuya Kawamoto. Graduate School of Environmental and Life Science, Okayama University, 3-1-1 Tsushima-naka, Kita-ku, Okayama-shi, Okayama, 700-8530, Japan. As one of the few long-term sustainable clean energy carriers, hydrogen (H2) has attracted a great deal of attention. It has been projected as the most promising source of energy with less pollution on environment, especially without CO2 emission. Biomass as a neutral carbon source is considered as an ideal primary energy source, which can be expected to gradually replace the depleting fossil fuels due to its worldwide availability. As one of the thermo-chemical method, gasification has its advantage for H2 production, such as fast rate of hydrogen production and low cost. 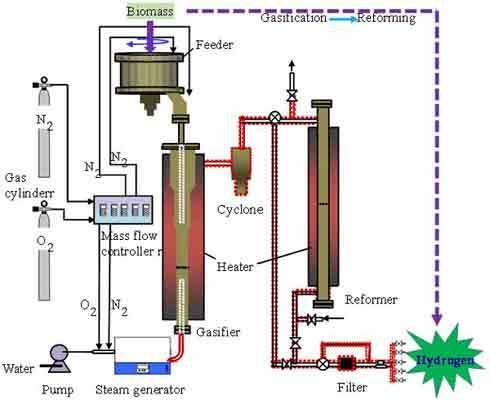 Gasification process often at high temperature is mainly accepted as the promising, attractive and effective technology to produce H2 from biomass. There are some vital process parameters which influence gas characteristic. In order to increase H2 concentration and reduce impurities, a reforming process following gasification is generally required, and effective catalysts can coordinate to achieve this. Thus, combining gasification and reforming processes are the most suitable method for obtaining H2 rich producer gas, and choosing a highly effective and suitable catalyst is the key challenge. Hydrogen can be obtained from two-stage gasification in industry level, which is used as chemical raw material. Keywords: Biomass, catalyst, energy, gasification, hydrogen, reforming. Affiliation:Graduate School of Environmental and Life Science, Okayama University, 3-1-1 Tsushima-naka, Kita-ku, Okayama-shi, Okayama, 700-8530, Japan. Keywords:Biomass, catalyst, energy, gasification, hydrogen, reforming. Abstract:As one of the few long-term sustainable clean energy carriers, hydrogen (H2) has attracted a great deal of attention. It has been projected as the most promising source of energy with less pollution on environment, especially without CO2 emission. Biomass as a neutral carbon source is considered as an ideal primary energy source, which can be expected to gradually replace the depleting fossil fuels due to its worldwide availability. As one of the thermo-chemical method, gasification has its advantage for H2 production, such as fast rate of hydrogen production and low cost. Gasification process often at high temperature is mainly accepted as the promising, attractive and effective technology to produce H2 from biomass. There are some vital process parameters which influence gas characteristic. In order to increase H2 concentration and reduce impurities, a reforming process following gasification is generally required, and effective catalysts can coordinate to achieve this. Thus, combining gasification and reforming processes are the most suitable method for obtaining H2 rich producer gas, and choosing a highly effective and suitable catalyst is the key challenge. Hydrogen can be obtained from two-stage gasification in industry level, which is used as chemical raw material.